Forget spring, summer has already arrived in many parts of Europe, and with wall-to-wall sunshine, warm temperatures, and a full cycling season ahead of us, now is the perfect time to unhook the Zwift and get out there on the open roads! There are some spectacular European cycling sportives coming up in the summer months, with the Mallorca 312 in May, the Stelvio Santini in June, the Maratona dles Dolomites in July, and the mighty Öztaler Radmarathon in September, but by October, things start to calm down, and that leaves many cyclists looking further afield. Winter cycling holidays are widely available for international riders who refuse to pack away their wheels until the first frost appears, and while most of them involve a long-haul flight, it’s a small price to pay for an extension on your 2019 cycling season. You could take a Road Cycling Holiday in Patagonia or Cycling Adventure in Africa’s Mountain Kingdom Lesotho, but if your idea of the perfect winter cycling trip includes spectacular scenery, fabulous boutique hotels, delicious dining options, and around 100km in the saddle each day, Cycling the Garden Route in South Africa should be your number #1 choice. Garden Route Cycling Holidays have grown in popularity in recent years, but there are many different variations of the route. While the original route stretches some 750km from Port Elizabeth to Cape Town (or vice-versa), many tours divert to Oudtshoorn to add a ‘mountain stage’ or two, while others skip Port Elizabeth and Plettenberg Bay altogether and start riding in Wilderness. If you are going to cycle South Africa’s Garden Route, you might as well do the Full-Monty and cycle the route in its entirety from PE to Cape Town. Your journey will take approximately 7 days and stop at highlights such as Jeffrey’s Bay, Storms River, Plettenberg Bay, Knysna, Oudtshoorn, Swellendam, and Hermanus before you finally arrive in the Mother City of Cape Town. If this sounds like your perfect winter trip, you’ll be pleased to know that there is a guaranteed Garden Route Cycling departure starting in Port Elizabeth on 6th December 2019! Check out the video below for inspiration and book your place today…! If you are thinking about cycling South Africa’s Garden Route, either on a winter sun holiday, or in the run up to the iconic Cape Town Cycle Tour 2018, you’ve probably got a great deal of questions about the route, the itinerary, and the average number of kilometres you are expected to cycle each day. A demanding road cycling tour that should only be tackled by experienced cyclists, the Garden Route covers some 750km from Port Elizabeth to Cape Town, and you’ll be covering that in just 7-days, so you are looking at cycling around 100km every day. Unless you book a private tour, you will be cycling the Garden Route with a mixed group, and while the guides do everything they can to balance the group, it is inevitable that some cyclists will be stronger than others, and there is every likelihood that your group will split into two. Anyone attempting this South African cycle tour should be able to maintain an average speed of 25km per hour across undulating terrain, and be prepared for temperatures up to 40°C, especially during pre-Argus week! We’ve allowed a generous timetable, depending on the terrain and temperatures, you may skip the afternoon snack break and head straight to the hotel, arriving any time after 2pm. Cycling the Garden Route is a once in a lifetime experience, but don’t be surprised if you want to do it again and again! There are many places in the world where one can enjoy a cycling holiday, but if you are looking for truly challenging road biking tour along one of the most spectacular coastlines in the world, South Africa’s Garden Route could be the perfect trip for you. A stunning 755km stretch from Port Elizabeth to Cape Town, the Garden Route features on most South African travel itineraries, but if you want to see more than just the most popular attractions, such as Tsitsikamma National Park, Plettenberg Bay, the Knysna Heads, and Oudtshoorn, one of the best ways to do so is on your bike. 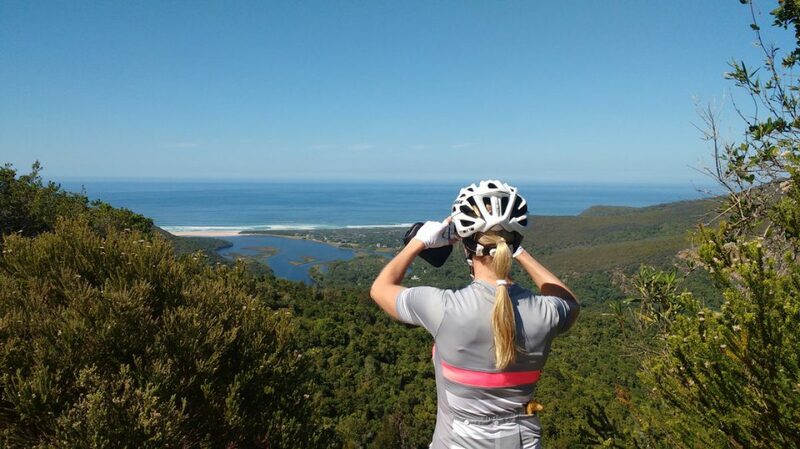 While there are many different variations that one can take, you really should attempt to cycle as much as the route as possible if you want to say that you have cycled the ‘real’ Garden Route, but that means many hours in the saddle, and so this trip is only suitable for experienced cyclists who know what they are letting themselves in for! Many people choose to cycle the garden route in the week before the iconic Cape Town Cycle Tour to get them in peak condition for race day, but with guaranteed monthly departures available from November to May, you can cycle this incredible route throughout the warmer summer months below the equator. After building your bike and shopping for any last-minute energy bars and repair kits, join your fellow riders for a welcome dinner at the Boardwalk entertainment hub. Your road cycling adventure along the Garden Route will start today with a 115km ride along the coast from Port Elizabeth to Surfers Paradise – Jeffrey’s Bay, where you will dinner and overnight. After an early breakfast, your second day of cycling will take you to Storms River and the Tsitsikamma National Park, where you can walk along the suspension bridges and enjoy sundowners overlooking the ocean. A slightly shorter ride today, you cycle from Storms River to Plettenberg Bay, one of the most beautiful parts of the Garden Route. After checking in to your hotel, you can head down to the beach for an hour or two before returning for a delicious 4-course dinner and overnight. After breakfast today, your journey will start with a 1 hour transfer from Plettenberg Bay to Wilderness, where you will begin one of the most challenging days of your Garden Route adventure. The route may only be 75km long, but there are some testing climbs along the way, and during peak summer months (January to March) you could be subjected to temperatures exceeding 40°C. Another challenging day, but perhaps not as tough as yesterday, you will cycle approximately 100km from the Ostrich Capital of Oudtshoorn to Ladismith, where you will hop on the bus and transfer to Swellendam for dinner and overnight. Another long day, but one that you will most definitely enjoy, you will cycle approximately 120km from Swellendam towards the coast and the small riverside village of Stanford. To avoid competing with traffic on the extremely narrow roads here, you will hop on the bus and transfer the short 20-minute ride to Hermanus, the Whale Capital of the world, where you will dinner and overnight. After 7 long days in the saddle, your last day will take you along the magnificent coastline from Hermanus to Gordons Bay, in what will ultimately be one of your best rides – ever! You will then transfer approximately 2 hours to Cape Town, where you can celebrate your achievement in South Africa’s Mother City. Interested in a Road Cycling Tour along the Garden Route? Find out more! Road Cycling Tour along the Garden Route Create a free website or blog at WordPress.com.